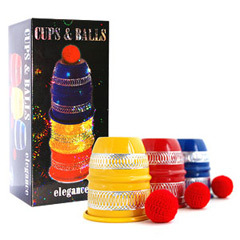 Three balls magically interact with three cups jumping from cup to cup, vanishing or appearing mysteriously. At the end of the routine under the cup will appear an object bigger than the balls and the audience will go mad! • The balls are slightly bigger than usual with a diameter of cm 3. • The aluminum cups have the following measures: diameter cm 6,5, height cm 8.